Location: Landlocked in Southwest U.S.
That's pretty much my gyoza filling mix, too. I usually ask my butcher to ground pork shoulder. Ratio to cabbage is pretty close to 50-50 by weight. nira, or Taiwan lettuce. Or chives. Again to taste. Modest flavorings: salt, soy sauce, sake, sesame oil. Knead and over-mix everything into a pasty glop. I blanch my cabbage, then chop finely. And then, I squeeze or press as much water out of the cabbage as I can. If the filling is too wet, the steam can expand during cooking and burst the dumpling apart. No binding agent, so knead and mix well to a homogeneous paste. Microwave a teaspoon of the mixture to taste test. Don't overfill. Maybe a heaping teaspoon. The round wrappers at my local market are a bit thicker than I like. Wrappers at Asian markets are usually sold frozen. Dip a finger into a bowl of water to trace the outer edge of the wrapper to fold and seal the dumpling. Standard rule of etiquette: you are not allowed to laugh at anyone's clumsily pleated homemade gyoza pieces. It takes a little practice. Everyone has their own favorite dipping sauce. Mine is soy sauce, white vinegar, sesame oil and a shake of togarashi red pepper. A lot of people also like soy sauce + ponzu citrus. Freezes well. Defrosts quickly. I like to boil for wonton soup. If I'm making them into potstickers, I toss them with a bit of fresh flour so that their bottom browns and crisps up with oil at high heat, before adding a liquid to steam and finish cooking them. I love my food processor.. I shred everything in it, dump it all into a bowl and mix with pork and wet ingredients. You can also buy cheap dumpling presses.. 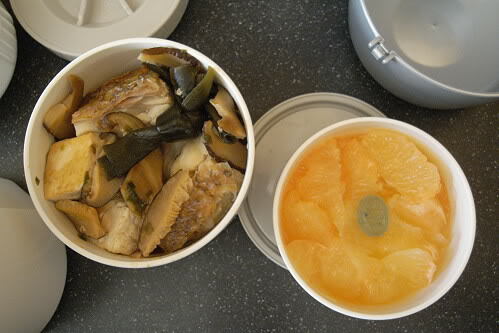 I just got one and it cut my time by nearly 50%..
Hawaiian pink snapper, a very lean white fish, half poached/steamed in a pan lined with kombu in broth of dashi, sake, dried shiitake mushrooms, tofu, scallions and splash of light soy sauce. It's been one month and one day since I last ate lunch. That looks totally great, Spork! Why did you add the cough drop? What kind of cough drop? I'm sick at home today. Last week, I made a lunch out of macaroni and stewed tomatoes, cornbread, and quail eggs pickled in beet juice. It was really good....and colorful. A little bit Ginger. A little bit Mary Ann. High Five for your pickled quail eggs, Kathleen, that is too much fun! I've tried dyeing mine in black tea. My menthol cough drop is part whimsy, part medicinal, but hard candies do dissolve well in the juice of lunchbox fruit and make for kid-friendly-healthy dessert. I'm sick at home today. So, did you want him to send you the cough drop? Welcome to Western New York, where the only kind of weather we have is inclement! What is everyone making these days??? I took advantage of some things coming in at the farmer's markets and in my garden to make a Vegetable/Cheese Frittata for dinner. Leftover frittata will go to lunch tomorrow along with a bit of my chilled watercress soup and some blueberries. Here is the picture. Please let me know what you are making! I did the rice with morel mushrooms, leeks and red peppers in the rice cooker. It didn't cook well, I had to keep adding liquid. Tasted good, but took me half the night to cook it in the cooker. I'll stick with plain rice in my Zo. 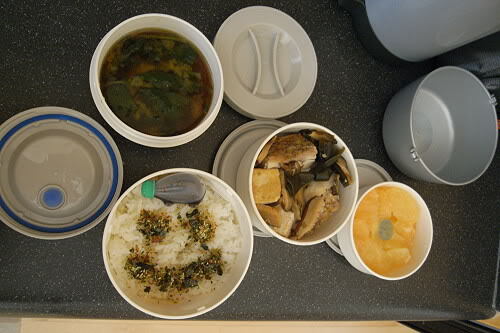 Okay, now that I am going up to have lunch with Dad every day (though he may only be another month), I want a bento box. I can also use it just to sit on the bench in our little green space outside our door and have lunch and play on my netbook when he comes home and is resting. I know it isn't really "getting away", but it is for me. I can take my phone with the intercom in case he needs me. I saw some when I went into Vancouver for the musical last Saturday, but didn't really have time to look seriously at them. So, I guess I will peruse this thread for links and suggestions!